I didn’t realize I was photographing such a destructive weapon when I took pictures of the nutria (alias coypu, ragondin, river rat, beaver-rat, or little beaver) last week at the Audubon Zoo in New Orleans. Looks like a beaver but has a more slender and partially furred tail. 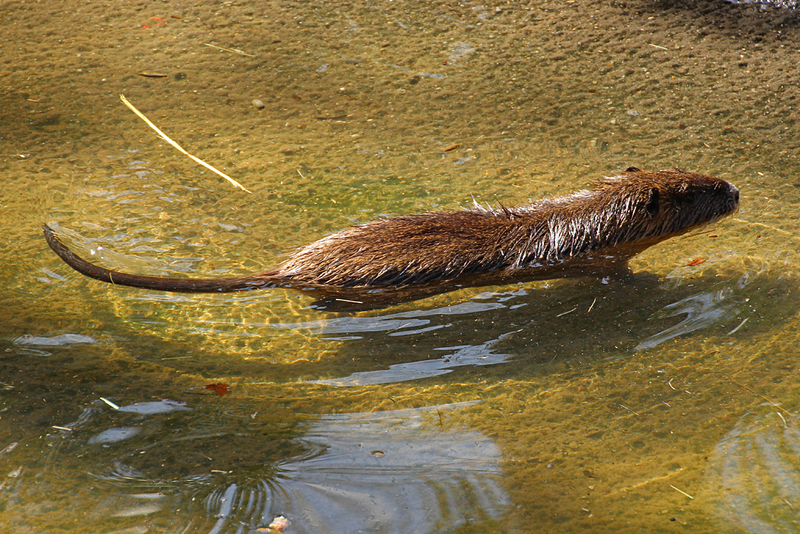 The Coypu are unique: they are the only member of their taxonomic family (that in itself is unusual); they grow and reproduce really fast — can reach sexual maturity in 3-4 months and females can produce as many as 3 litters a year, with each litter having as many as a dozen offspring; they have an astonishingly short lifespan (well, with all that reproducing, they must get worn out!) of less than 6 years, with only 15% of the population alive after just 3 years. Young nutria are born fully furred, can eat vegetation immediately after birth, and are only nursed for 7-8 weeks, after which they are independent. Perhaps these are young nutria with their mom. The female can be impregnated the day she gives birth — nursing and gestating at the same time for two months until the young are weaned. Their destructive potential lies in their wasteful habit of leaving 90% of the vegetation they cut down. They eat only the base of above ground stems, dig through the soil for roots and rhizomes of other plants, and generate large disturbed areas of fallen and uprooted vegetation. Obviously not good for native plants, and particularly for areas where soil disturbance leads to massive erosion, like the wetlands of Louisiana. 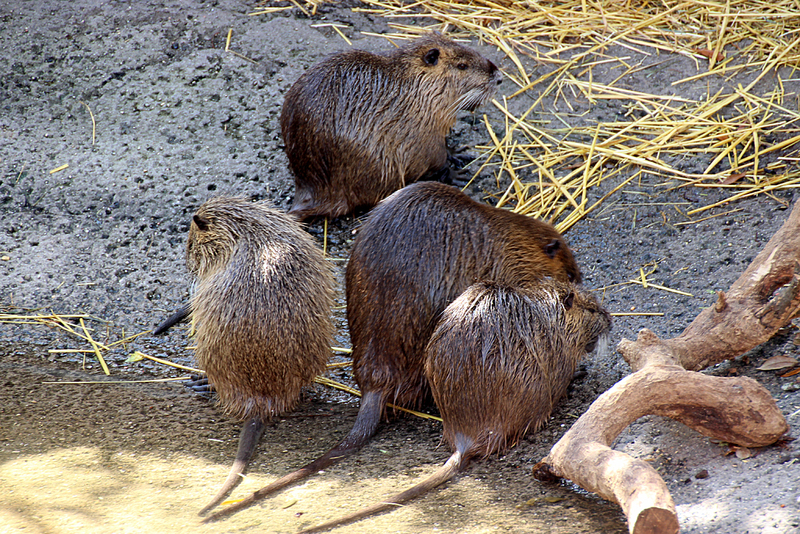 Adult Coypu eat about 25% of their 12-20 pound body weight per day, but harvest far more than they actually consume. Biologists have estimated that Louisiana wetlands affected by nutria damage decreased from 80,000+ acres in 2002-03 to less than 7,000 acres in 2010-11 (nutria were just one of the causes of the loss of wetlands here). These are the same wetlands that protect New Orleans and that part of the Gulf coast from hurricane damage. Similar habitat loss has been observed wherever nutria have been introduced (e.g., 7-8,000 acres in Chesapeake Bay after nutria were introduced in the 1940s). Nutria were introduced all over the world (except Australia) as a source of meat and fur, but their populations grew so fast, eradication programs are rapidly being established now. 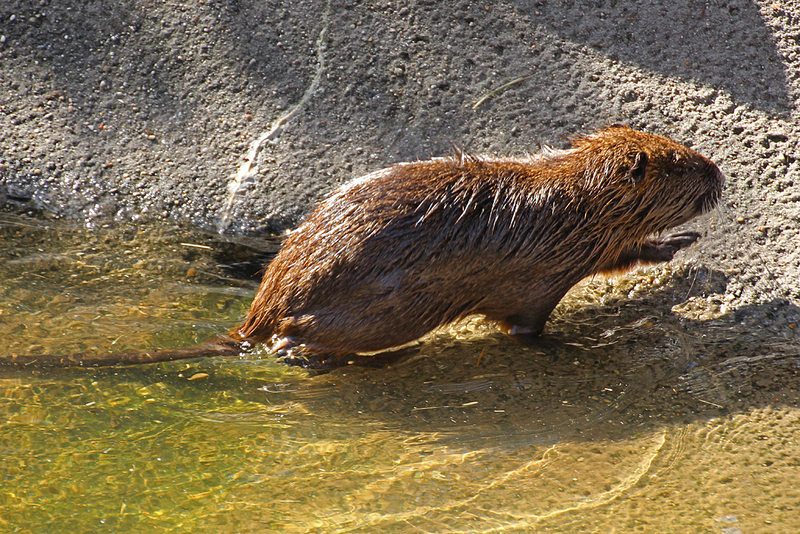 In addition to their environmental impact, they are also a host for a nematode (roundworm) parasite that can infect humans who wade in nutria-infested waters causing a dermatitis called “nutria itch“. So don’t go swimming in the bayou. This entry was posted in Mammals, Wetlands and tagged Coypu, Myocastor coypus, Nutria, Ragondin by Sue. Bookmark the permalink. I am a retired biology professor who has taken up photography to showcase the wonders of nature in my own backyard. Really good information, Sue. I knew they were destructive. Most exotics we foolishly release into areas where they don’t belong are. But I had no idea just HOW destructive they were. And I certainly didn’t know all that about their life cycle. Apparently we have them in parts of Florida, too, something I didn’t realize. Range maps indicate the worst areas are in the panhandle, but with breeding cycles like that, can it be long before they whole state has yet another exotic animals problem to deal with? Florida Fish and Wildlife Commission reports nutria breeding only in Hillsborough County, although they are present throughout the state. Paradoxically, they were released in Florida to control unwanted aquatic vegetation — wonder who had that dumb idea?! That’s what I call the “Old Lady Who Swallowed A Fly” syndrome. When it “wiggled and jiggled and tickled inside her,” she had to swallow a spider to catch the fly. And of course, she had to swallow a bird to swallow the spider, and and swallow a cat to swallow the bird. Eventually, she implodes, of course. Same mentality some of our regulatory agencies seem to have. I saw data that indicated the nutria are definitely breeding in the panhandle. Hillsborough County is the Tampa area, so that means they are spreading south, I guess? At any rate, they sound like bad news to me. Thanks for following up with so much information on nutria. I, too, had no idea they were so destructive. Just another example of the unintended consequences of introducing species into new areas. You have to wonder at some of the decisions made by supposedly well informed and well intentioned people. It’s not like there aren’t hundreds of previous examples of these sorts of man-induced catastrophes. Perhaps they were the inspiration for the episode with tribbles on the old Star Trek series.